Sukkot-The Feast of Tabernacles is in the months of September or October – the month of Tishri. Sukkot is the plural of Sukkah which means Tabernacle, booth, tent, or temporary shelter. 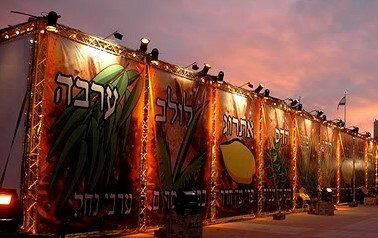 Sukkot is the third festival in the three festival cycle of mandatory annual pilgrimages to Jerusalem. These three recount the history of Israel Passover (pesah) reminds us of Israel’s deliverance from slavery in Egypt. Pentecost (shavuot) is a celebration of giving the Torah, that is God's law, at mount Sinai. One of the main aspects of Tabernacles (Sukkot) Is remembering the ways God tabernacled or dwelt with His people, Stephen summarised it just before he was martyred. In Acts 7:44-47 He said that the Tabernacle of witness refers to the stone tablets of the ten commandments, of the testimony being contained in the ark of the covenant in the tabernacle of Moses. Stephen was not opposed to the temple itself, but to the lifeless institutionalism it came to represent. worship the King, the LORD of hosts, and to keep the Feast of Tabernacles. And it shall be that whichever of the families of the earth do not come up to Jerusalem to worship the King, the LORD of hosts, on them there will be no rain. Rejoicing in the Law (Simhat Torah) comes to an end at the feast of tabernacles (Sukkot) but it is actually a holiday in it's own right. In Israel it is celebrated, like Shemimi atzeret, on the eighth day of Sukkot. Elsewhere people celebrate it on the following day. On this day all the scrolls are taken out & paraded around the synagogue by singing, reciting alphabetical verses & dancing, while children carry flags topped with apples & miniature scrolls. The next morning, celebrants make seven circuits around the synagogue! During the festivities, the congregation listens while readers finish the reading cycle for the year & begin a new cycle. Rejoicing in the law (Simhat Torah) is a relative holy day. It is neither mentioned in the Bible or in the Talmud. However, the regular reading of the whole Torah is commanded in Scripture. The story of Simhat Torah: During the early history of the nation, the kings often neglected God's command to read the Scriptures, But some kings led people back to the Lord & had the whole law (Torah) read aloud to them at least once during their reign. By the time of Jesus, most Jewish groups read through all the books of Moses in a three year cycle. Around the sixth century, most of the Jewish world excepted a one year cycle. Eventually they began to celebrate the completion of one cycle & the beginning of the next. The ceremony was called rejoicing in the law (Simhat Torah). By the fourteenth century, the celebration had become quite elaborate. Celebrants read the last reading in Deuteronomy & then rolled back the scroll & read the first reading in Genesis. Many other customs were adopted including the seven circuits around the synagogue (hakafot), the invitations to read (alliyot) extended to many individuals, the blessing of children, & feasting. Hakafot: "Encirclement" The highlight of rejoicing in the law (Simhat Torah) features & celebrates taking turns carrying the Torah around the sanctuary seven times. The ceremony is started by taking Torah scroll(s) out of the ark. A group of worshippers carries the scrolls once around the sanctuary, the children following with flags & miniature scrolls. When the scroll has gone around the sanctuary the people burst into singing & dancing. Then a new group takes the Torah for a second circuit, & another for a third. The Torah goes round the sanctuary seven times in this way to the western wall singing, dancing, & carrying the scrolls. Alliyot: Means going up. Often each man aged thirteen or older is invited to go up front & read a section of the passages for the day. Do not think that I came to destroy the Law or the Prophets. I did not come to destroy but to fulfil. For assuredly, I say to you, till heaven and earth pass away, one jot or one tittle will by no means pass from the law till all is fulfilled. Understand that Jesus' ministry fulfilled the law; it did not abolish it. Be warned that those that teach lawlessness will not be great in the kingdom. Hatan Bereshit: "The groom of the beginning." After the last reading from Deuteronomy, the scroll is rolled back to the beginning, & "the Groom of the Beginning" reads the first part of Genesis. Maftir: The third reader, the Maftir, reads the first chapter of Joshua, which shows the continuity of God's chosen leadership after the death of Moses. Celebrate The Whole: Today since we have the end of the story, the whole Bible including the "Good News" of the gospel should be celebrated Jesus tell us in JN 5:46 If you believed Moses, you would believe Me, for he wrote about me. Revere God's Word very highly, recognise it's fully divine source of inspiration. Submit to it absolutely. Faith believes absolutely in the divine inspiration of the Scriptures. Therefore the man or woman of faith has a very high view of the Bible, & is able to courageously face opposition unmoved. Therefore every scribe instructed concerning the kingdom of heaven is like a householder who brings out of his treasure things new & old. Some people would say that the highlight of the year in the feast keeping would be Sukkot, this may be the end of the festival year, but it is where many people find their first & greatest enjoyment. It was when they first began to leave home & gather with families for Sukkot that they got really excited & began to realise the filling of the celebration void they had been in for many years! It was also the filling of a fellowship void, because if the extent of your family’s previous experience of fellowship is just meetings that last a few hours & then you go home, you find the incomparable joy of not having to "go home" & realise why in the book of Acts 2:46 They "ate their food with gladness & sympathy of heart." There are bonds that have developed in the realms of worship & edification that never happen by just attending a church. One of the reasons that Father Abraham, the only human with a God-given deed to land, & a rich man also, never built a building or city (as far as we know). Is because he knew we were created to worship outdoors. He was looking for a city...made by God (Heb 11:10) There is nothing quite like the city, made by our inviting the Bridegroom, that you look out on tent upon tent of feast keepers It is SUCH an atmosphere for worship. Some people take an open area of a camp ground & make off the actual dimensions of the Tabernacles in the wilderness. Most will mark of the Holy Place, & the Holy of Holies. Many may have a giant Menorah (candelabra)made from seven bamboo tiki-lamps connected by strings of gold bead garland, & across from it a table with a Bible on it. There would be appropriate banners, & around the outside, tribal standers with the names of the tribes. Some could have a "going up" procession in which a leader with a bull horn called the various tribes from around the camp ground. Everyone would have a copy of the Psalm of Ascent (Ps 120-134). At the sound of the trumpet which could be heard over the whole camp, all began to read aloud. When the Psalms were finished another trumpet blast was sounded to begin the next. Even though the tribes starting with the furthest tribe, each group came forth. When they all get to the central area of the Tabernacle, they have a time for worship. Lilly Freeman (Wrote a Complete guide to celebrating Our Messiah in the Festivals), said that the first time she celebrated Sukkot was on a camping trip with her sister & her friends, what she kept seeing was how different Sukkot was from Christmas. Christmas she said is all about the rush. All ones time & money are spent long before all the presents are bought & holiday activities are done. This is on top of what has to be done to make life happen. & for what? Two hours of present opening & rushed family time. She went on to say that they celebrated Sukkot in a wooded area by a lake away from all the urgent cares of home & work. They all had time to study, dance, cook, & eat. But more then that time to visit & great visits they were. She has a friend who was her room mate at boarding school – but life had taken them in different directions. Now she got to spend a week watching & visiting, not only with her but with her children – all fourteen of them! She felt privileged to get an inside glimpse into the family dynamics that only time can give. She also was able to get into the lives of her nieces & nephews. She had the time for cuts & bruises, hugs & walks. She had the time to tell them stories of their mum & dad from long ago times. Time to hear their plans & dreams & what they were thinking. They had a time of opening presents around a tree & the gift of time they had to share. They saw God's masterful plan throughout the whole of history & Scripture. & were drenched in the understanding of why praying for rain was left for the last part of the feast. On the last day of Sukkot was Hoshana Rabbah which means the great Hosanna. First the High Priest descended with a throng of people to fetch water for the water-drawing ceremony. They went to the pool of Siloam where sick people waited to be healed when the water was stirred up became "living water." (Jn 5:2-7) Singing &dancing, the worshippers shook willow branches & the lulav. The Priests blew trumpets (shofars) & the crowds sang the Hallel (Ps 113-118) The High Priest filled the flask & returned to the temple. When he reached the water gate, other priests sounded three notes on the ram's horn (shofar) He went up the ramp to the alter & poured the water into a special bowl with spout through which the water flowed out. A second bowl with a smaller opening was pouring wine. Both bowls emptied at the same time. It is said that one has not seen rejoicing until he has witnessed the water-drawing ceremony. On this day, the celebrants went seven times round the alter praying, singing, & waving willow branches, remembering that is God's mighty hand that can save them, just as when Jericho was destroyed once the Israelites had circled seven times. The celebrants cried "Hoshana! save us now!" Each time around the alter, a portion of the Hoshana Rabbah liturgy was recited. People beat their willow branches on the ground until the leaves came off. The beating sounded like a rain storm, & was symbolic of beating off ones sins & praying for life-giving rains. The Hoshana chants included prayers for the nation, for Jerusalem, for crops, & for plentiful rain. The priest spoke of the coming Messiah (haMashiah) Who would pour out His Holy Spirit (Rauh hakodesh) on them Isa 43:3 speaks of God answering both of these prayers. Jesus also answered the prayers spiritually & eternally & He taught that He Himself is the Spirit of Living Water Jn 4:10;7:37-39. They had night time discussions – about life & death, hope & prayers, insight & wondering about God & the world. & laughing. Lots of laughing. But this only happens when you step out of the world & take the time. Sukkot gives a precious gift that is missing at Christmas – the gift of time. Sukkot can bring fond memories of spending one whole week with friends & family, worshipping God with singing & dancing for bringing His people out of the wilderness into the promised land.